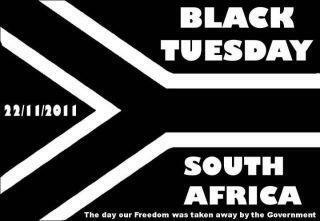 Fellow South Africans, Please spread the “Black Tuesday” message by the National Press Club. We call on South Africans to wear black on Tuesday to protest at the Protection of Information Bill. This is when the National Assembly will be voting on the controversial bill. SANEF is mobilizing editors to be in Parliamen…t. We will all be wearing black. Various organizations including Shout have come out in support of the call to wear black. We have had thousands of messages of support today. Let’s make our voices heard. We also call on newspapers to blank/black out some reports on Tuesday to highlight the dangers of the bill. Electronic media should bleep some reports and interviews. We welcome confirmation that some media houses will be doing this. The Press Club also supports pickets which are being planned by the Right2Know campaign. Let’s all stand up and make a difference. Say NO to censorship. Say YES to free speech and media freedom.